Whether you’re looking for PVC cards, Contact or Contactless, Proximity or Wiegand Cards, ID Security Online is your one-stop solution for ID card-printing needs. We also carry pre-printed cards, ideal for clients who require the same information printed on many cards and our ID cards come in both 10 and 30 millimeters and include Mag Stripe Composite and Adhesive Back options. A special section of our site is designated solely for Access Control and security needs. Here you can browse through a range of technology cards designed for achieving increased building security measures. Some of the variant uses for these cards typically include, but are not limited to driver’s licenses, official government identification, access passes and company security used for tracking human movement throughout the building. 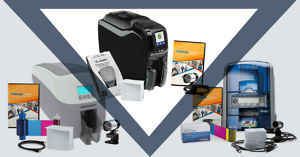 We as well partner with several of the best-known brand name ID card printer manufacturers in the industry: Datacard, Fargo, Zebra, Persona, Evolis, Magicard and Nisca, all of which include single-sided and dual-sided models as well as lamination card printers. 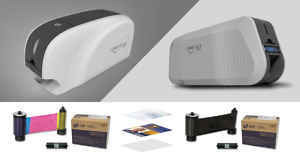 laminating card printers apply a holographic cover that makes counterfeiting more difficult to achieve and is seen as an increased security measure. Lamination also comes with the option of a standard clear cover, which is used for higher durability and protection against the elements. Our printers can be personalized and configured for specific printing needs, such as monochrome or color and between standard and holographic prints. 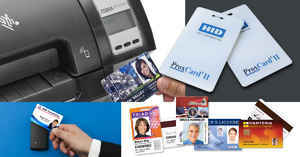 We also carry brand name ID card software, such as Asure and eMedia, compliant with single and dual-sided prints and multi-card printing, as well highly configurable so that you can customize your print settings. 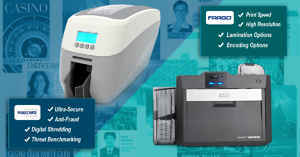 Easy to setup and simple to operate, our reliable printers will give you excellent results, meet your individual ID card needs and produce high-quality ID cards time after time. 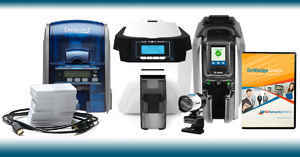 Finally, in the event that you need to replace or purchase more parts, we carry card printer supplies for all of our manufacturers, including accessories, ribbons, modules, upgrade kits and lamination supplies. Call us today at (800)-897-7024 and let one of our ID printing specialists help you decide if pre-printed cards are the right option for your company.